Open your PRICEFY.IO admin panel, then go to "Opportunities" and scroll down up to "Products Opportunities". In this section you can see the bestseller products for each of your sales category. PRICEFY.IO will retrieves your sales categories immediately after first catalog import so if you can't see any products listed in "Products Opportunities" section be sure than almost one product has been imported correctly. If you need to know how to import products please check this guide. 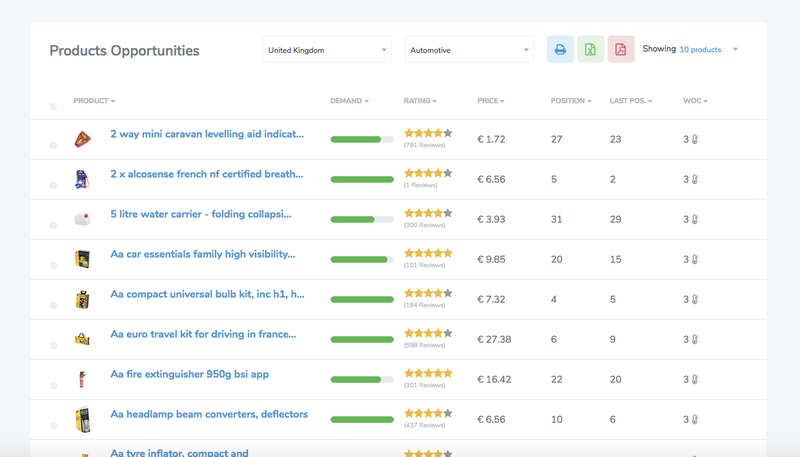 PRICEFY.IO checks multiple sources to determine which products of your categories are bestsellers. The list is full or valuable information that can help you increase your ecommerce sales month after month selling products that people really want. Demand: This value represent how much that product is requested by the market. The value bar can be more or less full representing how much that product is requested by the market but it never changes color (so even for the less requested products the bar will be green). This is because the ranking has been made over bestsellers products so is relative and compared to our general products ranking algorithm these products will always be considered highly requested. Rating: This is the average of all reviews we have found worldwide. It helps you understand if customers like this product even after they bought it. Price: The average price of that product. Position: Where that product is located over the bestsellers chart. Last. Pos. : The old position in chart. WOC: It means "Week On Chart" and is one of the most useful information for a retailer because let you know if that product is seasonal or not. Based on this you should consider if, for example, buy more pieces, having a huge discount because you will sell them continuously over the year.